The Naples classic of spaghetti all'aglio, olio e peperoncino — spaghetti tossed with extra-virgin olive oil in which a bit of garlic and red chile pepper (either dried or fresh) have been sauteed — is one of the simplest, quickest, and yet most satisfying, pasta dishes of all. It takes no more than about 15 minutes to make, including boiling the pasta water, so it's great when you're pressed for time, or for a late-night snack too close out an evening. 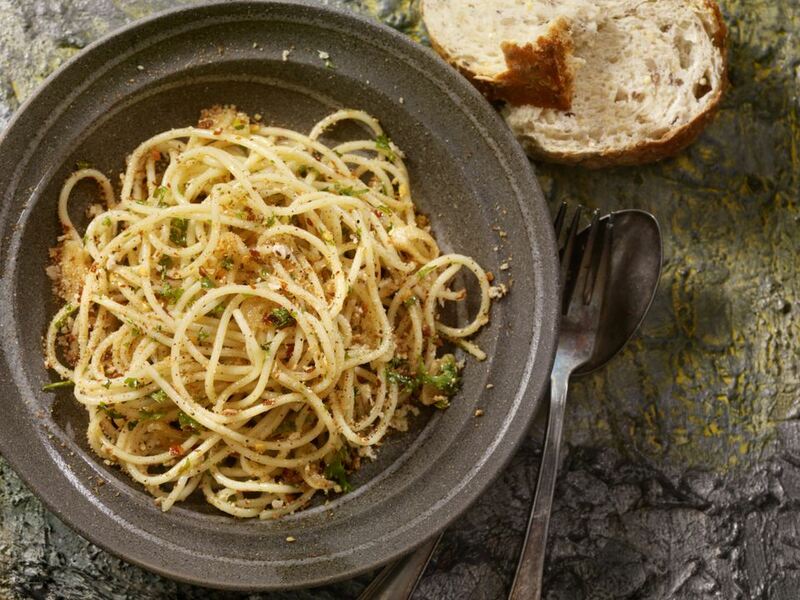 The most basic version contains only pasta, olive oil, chile pepper, garlic, and salt, things that most people will always have on hand in their pantry, but optional ingredients include fresh flat-leaf parsley and breadcrumbs. American versions of this dish tend to use far more garlic than is used in Italy – often twice as much – and in fact some Italians will even cut the garlic into large slices, saute them in the oil to flavor it, and then remove and discard the garlic slices before mixing the oil with the pasta. Feel free to adjust the amounts of garlic and pepper to suit your personal taste. Set a large covered pot of water over high heat to boil. When it reaches a rolling boil, salt the water and add the spaghetti, giving a few stirs to keep the pasta from clumping together. Add the minced garlic and continue cooking until garlic is just fragrant and lightly colored about 1 minute. Be careful not to overcook the garlic, or it will become bitter. Add the red pepper (dried or fresh) and chopped parsley and cook until fragrant, about 30 seconds. When your pasta is al dente, drain it, reserving a few tablespoons of the cooking water. Toss the spaghetti with the oil, garlic, and breadcrumbs until evenly coated. Add a little bit of the pasta cooking water, as needed, if the mixture is too dry.